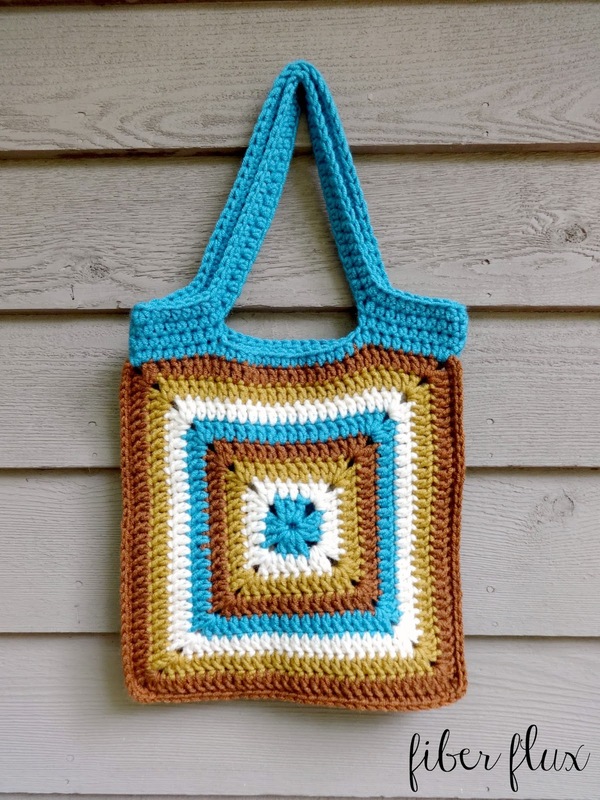 Fiber Flux: Free Crochet Pattern...Nature Walk Tote! 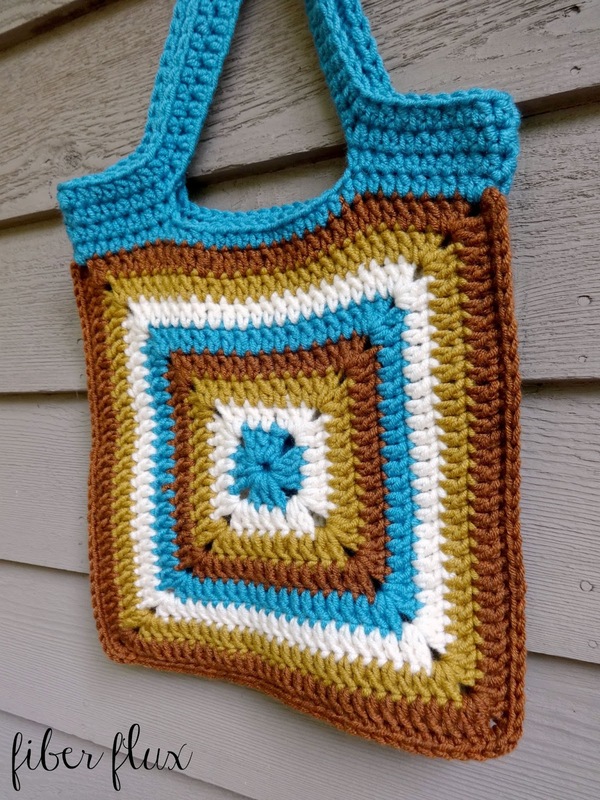 Free Crochet Pattern...Nature Walk Tote! The Nature Walk Tote is a fun tote that is also easy to stitch up. 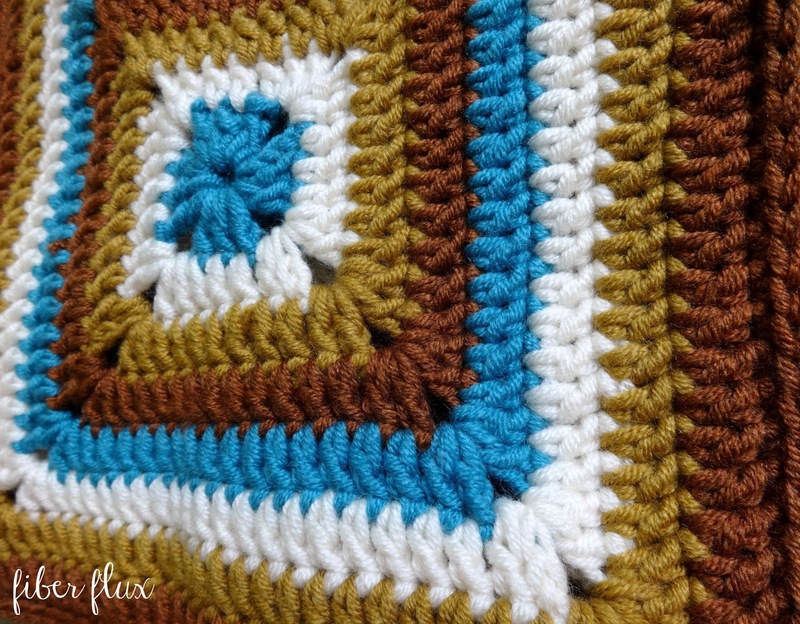 Two squares are sandwiched together and topped off with pretty handles. Have fun experimenting with colorful stripes for your tote too! 4 balls Lion Brand Woolspun (colors shown are "Honey" "Mahogany" "Aquamarine" "Fisherman"
Note: Each round is worked in a different color. Round 1: Tie on new color into a stitch (upper right corner) and ch 2. Work a hdc in each st across. When you reach the edges where bag was seamed, work 2 hdc in the first corner space you reach, skip over the seam then 2 hdc in the other corner space. Continue working a hdc in each st across and repeat when you get to the seam on the other side. Join with a sl st to close round. *Before proceeding, place stitch markers for bag handles. Be sure there is the same number of stitches in between the front two stitch markers and the back two stitch markers. Also be sure that the sides of the bag have an equal number as well. I had 15 in between-front and back (where the handle openings will be, where an arm will go through) I had 17 stitches on either sides of the handles. Please note: your stitch count may vary slightly than what I had, but just be sure that the numbers match up (mine were 15 and 15, then 17 and 17 if that makes sense). Round 2: Ch 2 and work a hdc in each st. When you come to the stitch markers, remove it and work a hdc in that stitch. For the handles shown, ch 42. Skip over to the next stitch marker and work a hdc in that st. Work a hdc in each stitch until you arrive at the next marker, then repeat for the other handle. Continue working a hdc in each st until you reach the end of the round. Join with a sl st to close round. Round 3: Ch 2, then work a hdc in each st all the way around. Join with a sl st to close round and fasten off. Note: If you would like thicker handles than the ones shown in the photos, simply work round 3 until they are the desired width.